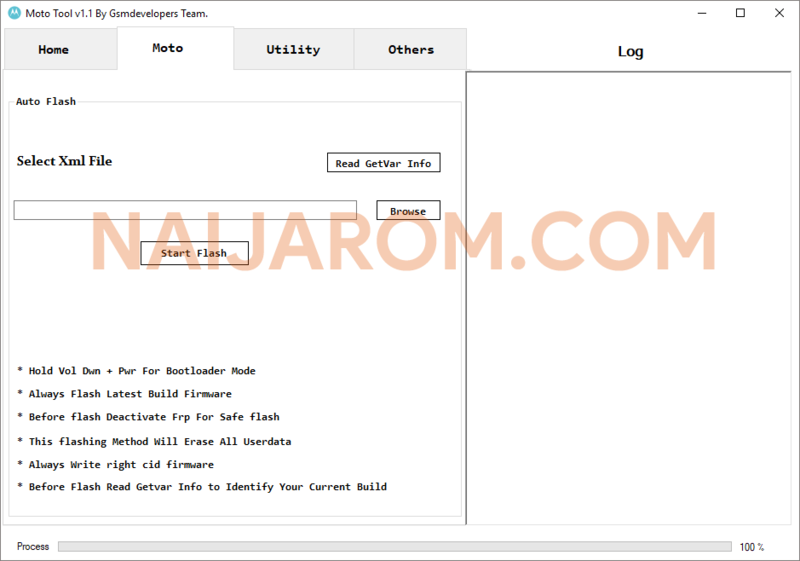 Moto Tool v1.1 is a small application for windows computer which allows you to flash the Stock Firmware on Motorola Smartphone and tablets in a single click. It allows you to auto Flash the Stock Firmware on Motorola Device. It supports Motorola XML Firmware Flashing. It also comes with some extra features including rebooting the Motorola device into the bootloader, Rebooting into the recovery mode, Reboot the device, Remove teh FRP protection. It also allows you to read the device information, Reboot the device, Write any custom recovery or stock recovery on the device, unlocking the bootloader of the device. In order to use the Moto Tool properly, you need to install the Universal ADB Driver on your Computer. Once Driver is installed you can successfully connect your Android Device to the computer, and launch the Moto Tool on the computer. [*] Credits: Moto Tool v1.1 is created and distributed by GSM Developers (developer). So, full credits goes to GSM Developers (developer) for sharing the tool for free.